The news for the Phillies on Wednesday went from bad to worse. First, it was word Rhys Hoskins had fractured his jaw after fouling a ball of off his face on Monday, then Zach Eflin stumbled through four innings in a lackluster 8-2 loss at Dodger Stadium. Nope, Wednesday wasn't kind to the Phillies. The club will have to win Thursday night to manage a split with the Dodgers. Eflin surrendered five runs on seven hits. After piecing together two outstanding starts in early May, he's struggled over his last three surrendering 12 runs over 13 1/3 innings. "He had stuff, just had a tough time locating and fell behind," manager Gabe Kapler said afterward (see video). " Compounding matters Wednesday night was an anemic offense from the Phillies that didn't push a run across the plate until Nick Williams drilled a solo home run to center to open the seventh inning. With Hoskins requiring time off for his injury, Williams and Aaron Altherr are going to see regular playing time in the outfield. 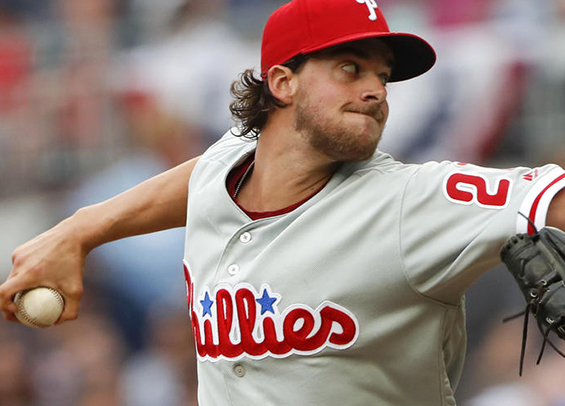 Aaron Nola takes the mound for the Phillies, looking to build on the success of his previous start when he battled two rain delays and carried a no-hitter into the seventh. The Dodgers counter with Clayton Kershaw who has missed the last month dealing with tendinitis in his throwing elbow. The Phillies officially placed Hoskins on the 10-day disabled list Thursday afternoon and recalled Dylan Cozens from Triple-A Lehigh Valley. The 24-year-old is the 16th best prospect in the organization, according to MLBPipeline.com. He was hitting .225 with 10 home runs in 50 games with the IronPigs this season. He has a ton of power, but also whiffs a ton. The Phillies also recalled reliever Mark Leiter Jr. and designated Drew Hutchison for assignment.